Go beyond goblins with an army of fantasy's most fearsome foes! 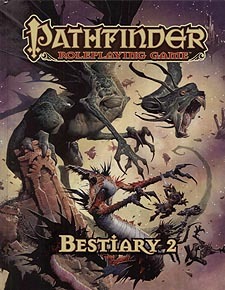 Bestiary 2 presents hundreds of different creatures for use in the Pathfinder Roleplaying Game. Within this collection of creatures you'll find undead dragons and mischievous gremlins, shrieking banshees and unstoppable titans, the infamous jabberwock, and so much more! Yet not all these monsters need to be foes, as new breeds of otherworldly guardians, living shadows, and vampires all might take up adventure's call. In addition, new rules for customizing and advancing monsters and an expanded glossary of creature abilities ensure that you'll be prepared to challenge your heroes wherever adventure takes them! The Pathfinder RPG Bestiary 2 is the second indispensable volume of monsters for use with the Pathfinder Roleplaying Game and serves as a companion to the Pathfinder RPG Core Rulebook and Pathfinder RPG Bestiary. This imaginative tabletop game builds upon more than 10 years of system development and an Open Playtest featuring more than 50,000 gamers to create a cutting-edge RPG experience that brings the all-time best-selling set of fantasy rules into the new millennium.